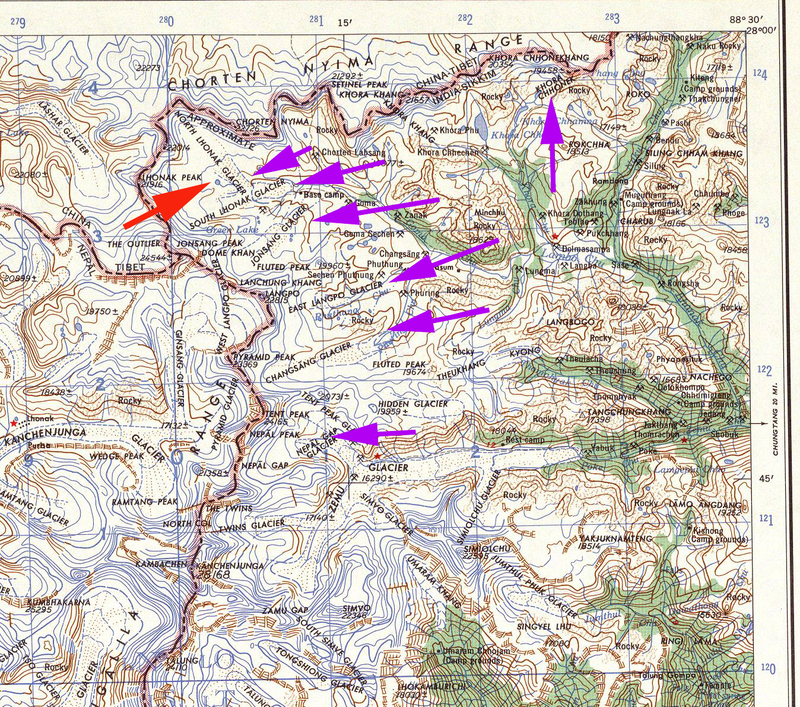 “Middle” Lhonak Glacier is an unnamed glacier between North Lhonak and South Lhonak Glacier near the border of the state of Sikkim in India and Nepal, red arrow on first map. I have previously reported on the retreat of South Lhonak Glacier whose retreat has led to a significant proglacial lake expansion and nearby Changsang Glacier. Here we examine landsat and Google Earth imagery from 2000-2013. Like all glaciers in this region Middle Lhonak Glacier is a summer accumulation type glacier. This means that the glacier receives most ~80% of its snowfall during the summer monsoon. This is also the period when ablation low on the glacier is highest. Following the summer monsoon which ends in early September there is a transition period with some colder storm events where the snowline drops. Than from November-February is the dry winter monsoon with limited precipitation. Thus, strange compared to most glaciers as winter proceeds often the lower glacier remains snow free. The pre-monsoon season from March-May features increasing precipitation, temperature and rising snowlines. The glacier drains into the Teesta River, which has several existing and many proposed hydropower projects, mostly run-of-river with minor dams. Weather records from Pyramid station at 5000 m in Nepal indicating the peak temperature and precipitation occurring in summer monsoon. 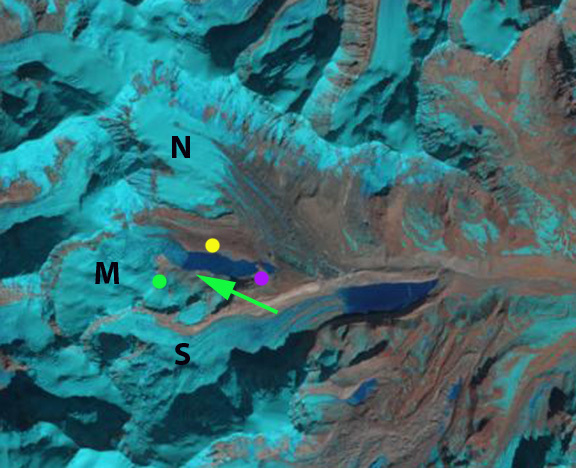 In 2000 and 2001 Middle Lhonak Glacier ends in a proglacial lake at the yellow dot. 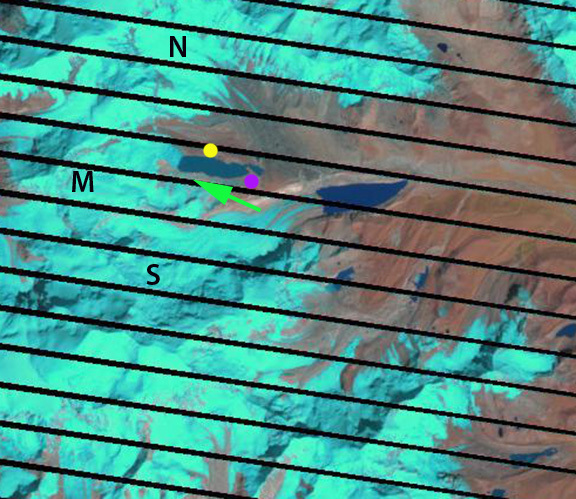 The pink dot indicates a small peninsula in the lake. 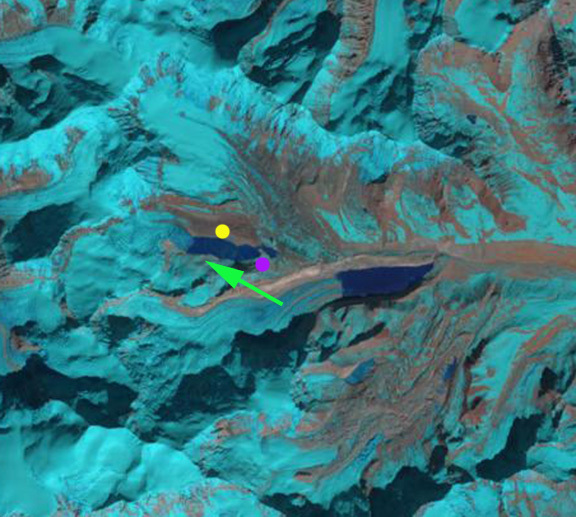 The green dot indicates a bare rock area that separates two arms of the glaciers. 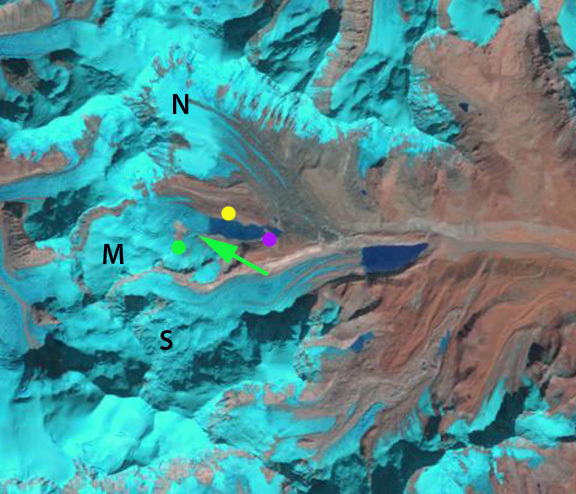 The green arrow indicates where the two arms of the glacier join. 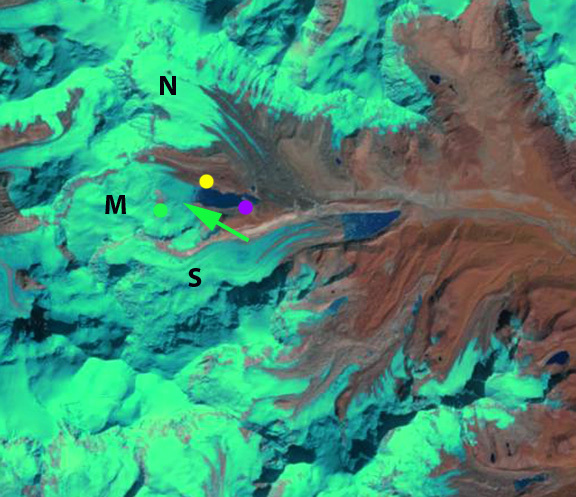 By 2005 the glacier had retreated from the yellow dot, but the two arms of the glacier still connected, green arrow. 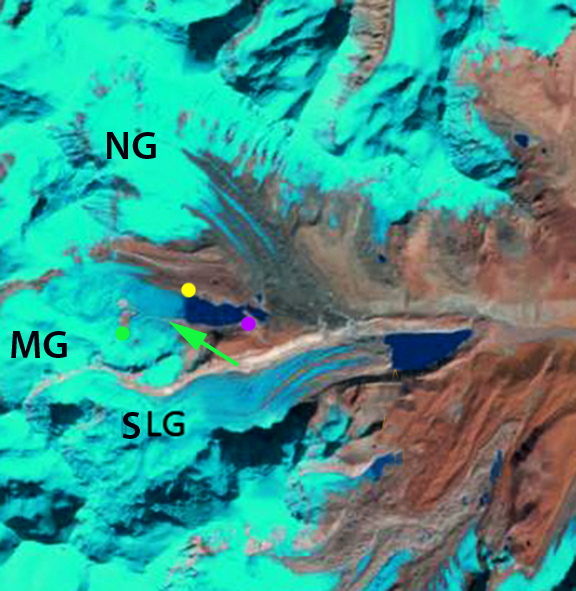 In 2006 a higher resolution image from Google Earth indicates the 300-400 m retreat since 2000 of the glacier. The two glacier arms still join, green arrow, though barely. There is a substantial icefall that begins at 5800-5900 m, as noted by red arrows. Above the icefall the glacier is almost always snowcovered, but the icefall the glacier often remains snow free for much of the year at around 5700 meters. This will be explored further in a sequence of 2013 images below the terminus change sequence. 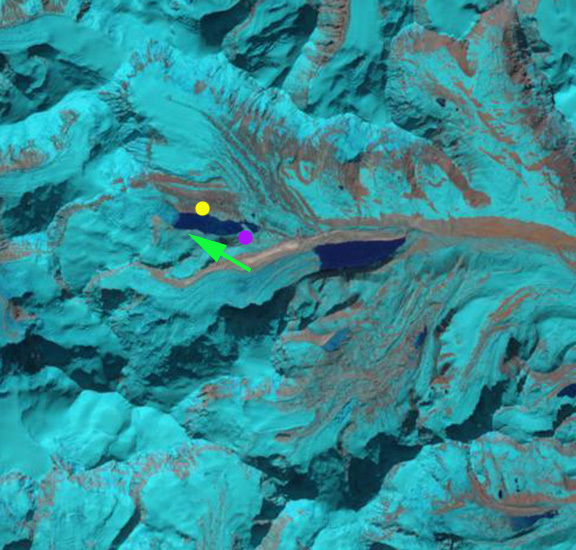 In 2013 the two arms of the glacier have separated, the green dot bare rock area has greatly expanded and the glacier terminus has retreated 500-600 m since 2000. A series of images below indicate the snowline in a period from October 12, 2013-December, 21 2013. On October 21 the snowline is at the last bend above the terminus at 5650 m. By November 21 the snowline has shifted little. 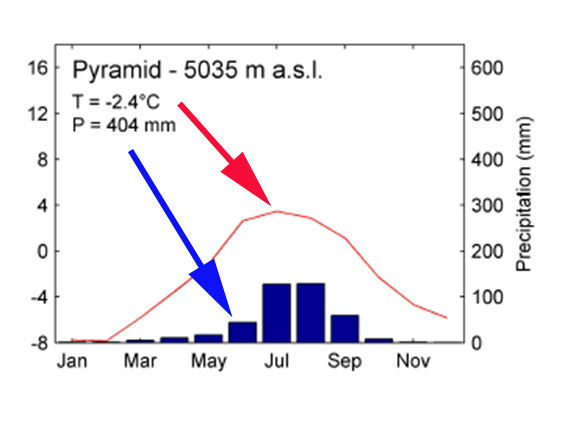 By December 1 the snowline has begun to rise to 5700 m. The rise has continued to 5750 by December 21. The lake at the terminus remains unfrozen. 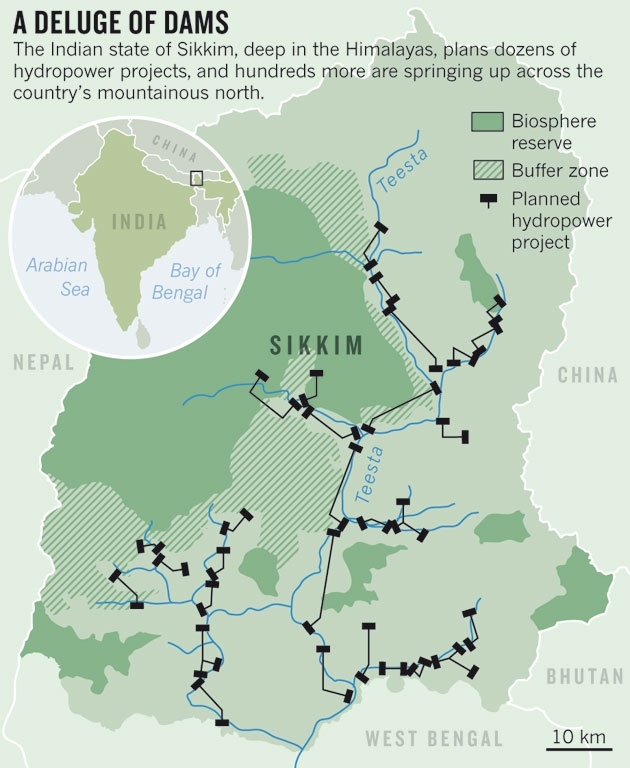 This entry was posted in Glacier Observations and tagged himalaya snowline, India glacier retreat, lhonak glacier middle retreat, sikkim glacier retreat, sikkim hydropower. Bookmark the permalink.